today i got this email. 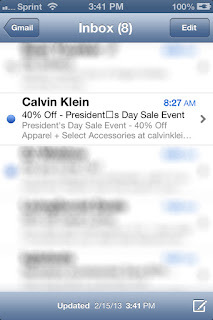 and it's one of those things that we all have done and learn the hard way... to make sure that our subject lines are spelled properly, email marketers will often take that subject line and cut and paste the text into word or another word processor and run spell check on it. then without thinking, (i have even done it) you take and cute and paste that text into your sending tool. it looks fine right? the problem is, that most of the sending tools need or use "plain text" and regardless of how plain a font you select with the word processor, it will always pull some amount of formatting over with it when you paste it into the tool, and it is most often associated with punctuation. 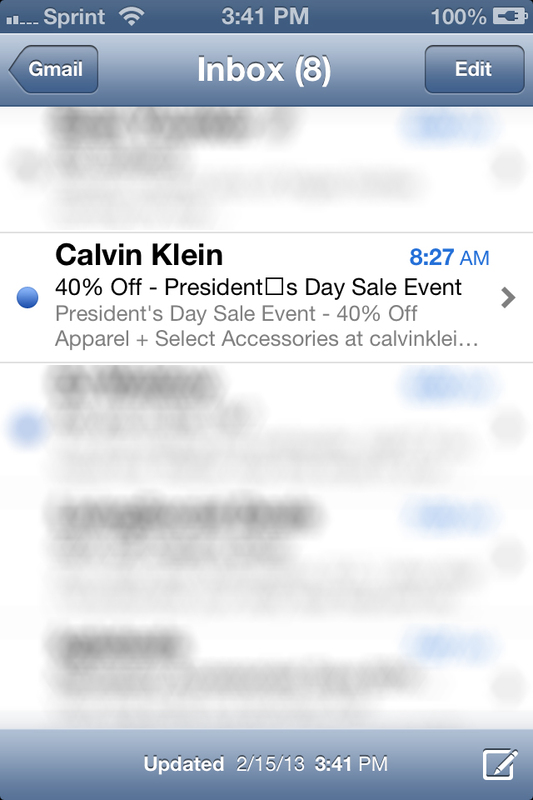 in this case, this email from calvin klein (it's so cool that he and i exchange email....) should have had a subject line that said "40% Off - President's Day Sale Event", instead the apostrophe was a "pretty one" in word and it got pasted into the tool, which resulted in this subject line flub. Of course like all "errors" with email marketing, they are completely platform specific and won't always render on all emails.